I will explain some more about my reduction process philosophy. In a way it is a software that I use in my mind to analyze the different SAKs and products. Victorinox are very good in making a huge amount of different models and categories for any need. Like you know most of the knives got traditional standard functions. You can get single blade knives or other minimalistic knives today. Reduction process philosophy is not about becoming minimalistic in any way. Today there are so many accidents and people dying from what are trivial situations that easily should be overcome by a cutting device or functions. 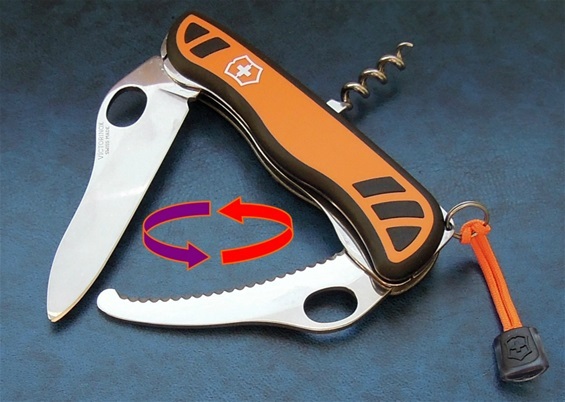 The Swiss Army Knives has saved many lives without any doubt. There are thousands of witnesses to this in the world. 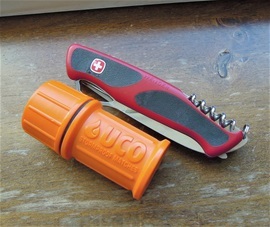 The Wenger and Victorinox knives perform and overcome problems. Most of my research on making a system for reduction process philosophy is to have the absolute best knives for safety and rescue. If you study sakhome.com you will find much information about what my mind has been occupied with for a long time. Survival is in my opinion reduction process philosophy. It is about having the tools for the basic challenges in the everyday life for people. Once again I would like to mention that people are forgetting basic simple abilities like swimming and how to use tools. Most people are so comfortable with boats, cars and other and that things never goes wrong. Until it happen and people do not know what to do. Knives and tools are just as important today as in any time period of the world. Tools were invented exactly because of survival and to avoid accidents. Another problem in the society is the lack of knowledge and education for kids and grown-ups for that matter about simple receipt for avoiding dangerous situations. In all the process I learned just exactly why knives have serrated edges, one hand opening, ergonomic handles, locking mechanism and other abilities. I learned how larger tools save time and that they require less sharpening between maintenance. The last maintenance is very important for everything. To use my process is not about exaggeration in any way. It is just about having basic abilities and to understand that the best comfort comes from knowing basic abilities and to actually be able to save other people as well. If every person know basic abilities then there would be less people dying and there would be a correct comfort. In this country Norway we have a modern society but we cannot forget that we live in a country with tough weather. I checked the water temperature today and it is between 1-2 degrees + Celsius. It is a deadly temperature. My philosophy is about analyzing Swiss Army Knives and to learn. I learn from the knives every day and that is important to be able to become a specialist to not believing I know everything when I don’t. I am always open for knowledge all the time and anywhere. In this country many die every year from cars going into the water, people going through the ice and drown because of other situations. Survival happens in or around populated areas and usually not in the wilderness at all. 98% of all tragic accidents happen in or around populated areas believe it or not. Is it really necessary to die from not having a cutting device? I would be very happy if you all could read through my page that include my philosophy and pages that I made and developed for you. SAKs sound, light and basic abilities like how to use them and to swim. To take precautions with weather situations and to have a floating device on the body when on the water saves lives. It is a frustrating feeling every time I read the news and I feel it how unnecessary it is. Today people are active with sports the year around and exercise to keep the body in shape. How many of them practice the parts I mention? If you walk on the ice then it can be smart to check it with a stick of some kind in front of you. Survivalist and experts or experienced people would bring ice picks with them. My recommendation is a bit different than most survivalist would. I would bring dry clothes in a rucksack in a water resistant bag. My SAKs, light, ice picks and whistle. Survivalist trains with making a fire to warm up after they get out of the icy water. This is a risky philosophy for most people and requires extra training. It is very smart to learn anyhow. If you do not manage to get out of the water then you scream and signal for help. If you get out of the water then it is much easier to take of the wet cold clothes and put on dry clothes than making a fire naked or wet. Today you can bring clothes that are lightweight and still able to keep you warm. Maybe a thermal blanket of some kind would be smart. It is important to call someone that you went through the ice and explain your situation. It is fully possible to get a shock that comes afterwards the situation. I do not recommend people to go on the ice if they are not physical able to be safe. It is also smart to not being alone. Today you can get different suits for survival. If you spend much time on the ice then this is smart to have. It floats and keeps you dry. You can get out of the water laughing! On the water in my fishing kayak from spring until autumn I learned a great deal. Tested a few things and learned to become experienced. When I bought my fishing kayak years ago I noticed a large warning sticker on it. It says it is physical demanding to use kayaks! I did not laugh about it; I took notice and took it seriously. It does not help challenging nature in any way in reality. It is better to adapt to it and use reduction philosophy to make it safe and comfortable at the same time. Be prepared and enjoy the water simultaneously. It helps to read some about kayaking before-hand but it is nothing compared to practical experience. I came home looking like a drowned cat sometimes because of the weather. Luckily for me I have some nautical experience and that very helpful. Theory and practice walks hand in hand. Fog, wind and waves are a bit dangerous in a kayak because of several factors. Climatic changes can make strange currents and problems. To learn to fish from such a floating device was educational, fun and interesting all together. One must take into consideration fatigue and safety every time you are out. Today you will find belt and webbing materials in a huge number of different applications. Basically the belts will help you to survive crashes, accidents, fire and situations. There are also several different methods for attaching the lock for the seat belt and how to release it. It is so that to release any safety belt can be difficult when it is under pressure. They can get damages from accidents and wear. A knife is the ultimate tool for such belts. In a car upside down it can become a challenge but the knife will cut you free. Belt-cutter and rescue blades are perfect for such tasks. Serrated blades will destroy belts and webbing materials. In my life I have noticed such designs, materials and types. Today i will show some extreme quality matches. It is an UCO match kit that is stormproof. You can find further information on the abilities at their website. 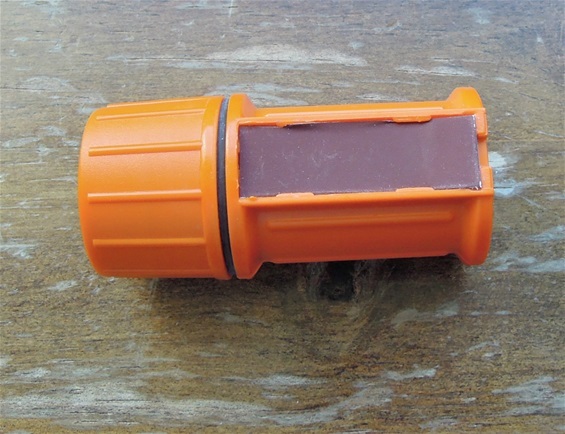 It is very popular today to use storm-lighters and high quality outdoors lighters. Wenger also got a few of those. It is also normal today that people bring FireSteel for safety and outdoors needs. This requires practice and training to use and depending on weather situations and other demanding factors it can be a risky philosophy. 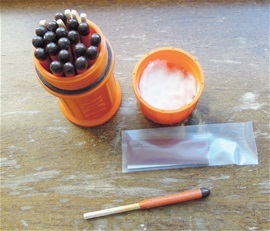 The set with stormproof matches in this quality container can be very valuable to bring. It will make the task far easier and save valuable time.